Which MLB Teams Are A Steal To See And Which Should Be Called Out For High Prices? Spring is in the air and baseball has begun. We all know a trip to the baseball stadium can cost big bucks, especially if you want to surprise your sweetheart with a proposal. So, before heading out to cheer on the home team, you might want to take a look at what you can expect to pay for the experience. Want a hint? It’s more than last year. Ticket and concession prices are on the rise once again at Major League Baseball stadia across the country, according to the annual Fan Cost Index (FCI) report by Team Marketing. The average ticket price increased slightly to $27.93 from the previous average of $27.48. Likewise, the average cost of a hot dog increased to $4.32 from $3.91 a year ago and a cold beer now comes in at $6.09, up from $5.85 during the 2013 season. Of the 30 MLB stadia surveyed for the report [PDF], 17 teams increased the average ticket price by more than 1%, while only two teams lowered prices. The team with the highest average ticket price increase? The Kansas City Royals. Coming off their first winning season in 10 years, the team’s average ticket increased to $24.73 from $19.83 in 2013. Still, Kauffman Stadium remained one of the 12 cheapest in the MLB. Going against the increase trend is the Houston Astros. After finishing with one of the worst records in 2013, the team lowered ticket prices nearly 14%, coming in with an average of $27.98 per ticket, down from $30.09. 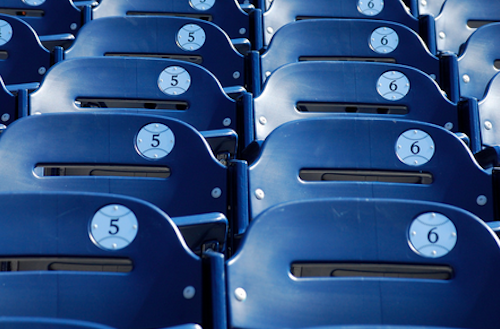 For a true baseball experience you’re going to need to add in a trip to the concession stand. And $20 won’t get you much at some stadia. The most expensive stadium experience happens to be Fenway Park, home of the Boston Red Sox. Fans can expect to pay an average of $52.32 per ticket, a 4.8% increase over last year. For $20 at the concession stand you can get a 12 oz. beer and two hot dogs. On the low-end of the price spectrum are the Arizona Diamondbacks. While the average ticket price increased 6.4% over last year, paying an average of $17.98 to see your team isn’t too bad. And get this, a hot dog costs an average of $2.75 at Phoenix’s Chase Field. Now, that’s a steal. For $20 you can leave the game with a full stomach after consuming four hot dogs and two 14 oz. beers. It should really come as no surprise that the cost to experience baseball first-hand is increasing. MLB has undergone quite a transformation from just 20 years ago. Earlier this year, Consumerist reported on the number of teams with corporate sponsored stadia. Only nine stadia remain unattached. And of course, the fare at stadia has changed, from the evolution of nachos to stadia embracing the use of technology to order food and social media to hawk beer.